Enjoy a night out at the ballpark and support EcoAction Arlington at the Washington Nationals ‘GreenSlam’ fundraiser night. The Nationals are taking on the Philadelphia Phillies, and your support of ‘GreenSlam’ can help EcoAction Arlington continue fighting climate change and protecting our environment. By purchasing your ticket for the Nationals vs. Phillies game on ‘GreenSlam’ night from https://groupmatics.events/event/Greenslam, you’ll receive up to 20 percent off the ticket price. 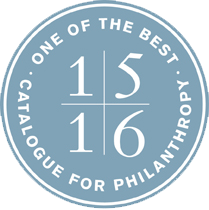 And, you can show your support for EcoAction Arlington by selecting our organization when you purchase your ticket. 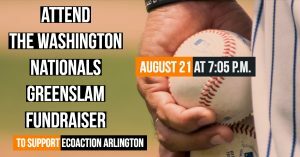 The Washington Nationals will donate $4 to EcoAction Arlington for every ticket purchased from the link above for the ‘GreenSlam’ fundraiser night, Tuesday, August 21st at 7:05 p.m. It gets even better; because when you support the ‘GreenSlam’ fundraiser night at the Nationals vs. Philadelphia Phillies game #ForestPlanet will plant ten trees.